Zhengzhou Elephant Telecommunication Company Limited. Introduction：To be expanded to detect “Reverse”,“Respond” or “12/16KHz signal” charge mode program. ET8868 P/T (LCD) is advanced digital technology and comes with the whole range of features including novelty appearance, modularized circuit, reliable software, and simple operation. It is specially designed to satisfy different needs of the customers and can be used in different environments. This model is designed for use in public places such as hotel, restaurant, guesthouse, school, hospital, factory, workshop, entertainment places, tourist sites, and public telephone agencies. It can support different kinds of local calls and long distance calls, metering and timing automatically. 1. Micro controller unit (MCU) controlled. 2. Accept different kinds of coins. 3. CO line/PABX compatible with 1 or 2 outgoing number. 4. Incoming call timing and tariff charge rate control. 5. 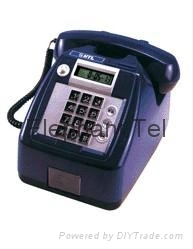 Keypad programmable: Free call, Barred call, Local call and STD call tariff charge rates programmable. 6. 8-digits owner password for free calls. 7. LCD displays real time clock, calling time limit count down, amount of coin put in, amount of coin need for continues the call and the setting contents. 8. Maximum 4 coins can be put in per time. 10. Can program to display the owner's telephone number. 12. Redial the number without withdrawing the coin. 13. Dial another number without withdrawing the coin(Flash feature). 14. Warning tone at 20 seconds before the line is terminated. More advanced features such as AUTO COLLECT THE COIN AGAINST VOICE/REVERSAL SIGNAL and TRUE/FAKE COIN VERIFICATION is available.